DMT - Dave Moss Tuning | Suspension Tuned! 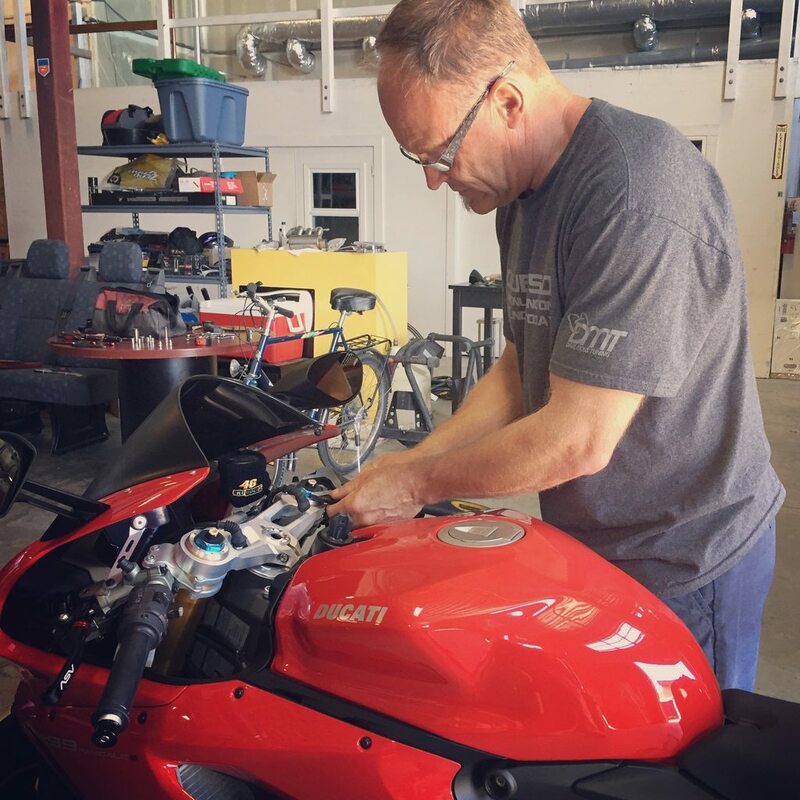 Got the chance to stop by Dave Moss' shop in Richmond, CA today and get my 1299S tuned to my personal prefs. First, adjusting the preload on the TTX rear shock absorber. Then Sag and Preload. Once the manual adjustments were made, Dave started inputting the setting in the Riding Modes. Off to a test ride then back to the shop and repeat for fine tuning then setting new profile for Track, Canyons & Street. What an experience! 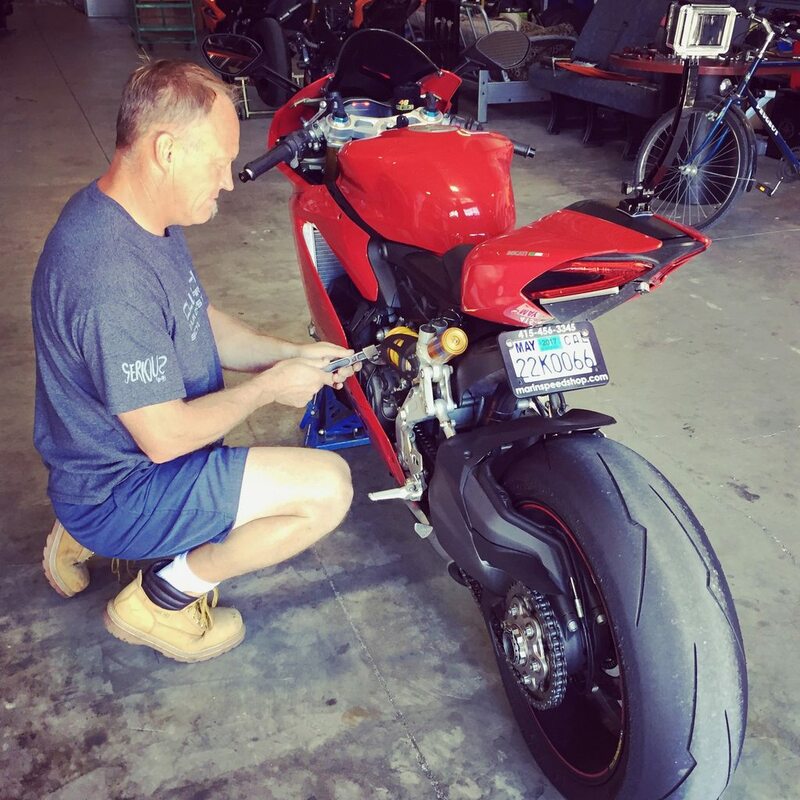 He's quite the well of knowledge, super down to earth, friendly and within 60 mins my 1299S was tuned for street, canyon and track! Def. $$$ well spent! Dave is a great guy for sure. Im guessing all of the hardware (spring rates) were within your rider weight specs for adjustment? Was there a plan in place for the evaluation of the progress or did you find some area where you could at least get a evaluation of where things were? I need to get up there but im confident im going to have to play with spring rates.Thanks for the report. Yeah, being a lightweight -- 5'7" for 155Lbs -- he had to basically get the hardware to the min. settings ahahah but everything was still within specs. with room to go either directions. I'll follow up with him by next spring to see how things go but he did give me the next adjustments I'd need to make as I get more confident on the bike... Temperature will be the factor impacting this tuning the most so by next summer I'll have to make some adjustments and see if I like it. He also gave me the fork oil service interval I'd need to consider for this setup. Thanks man. The SoCal Catalyst shop is 20 min from my house and they have a Dyno. I will probably head there tomorrow to play with it. It's never really been sorted sinc it was finished. Be careful with your spring rate . 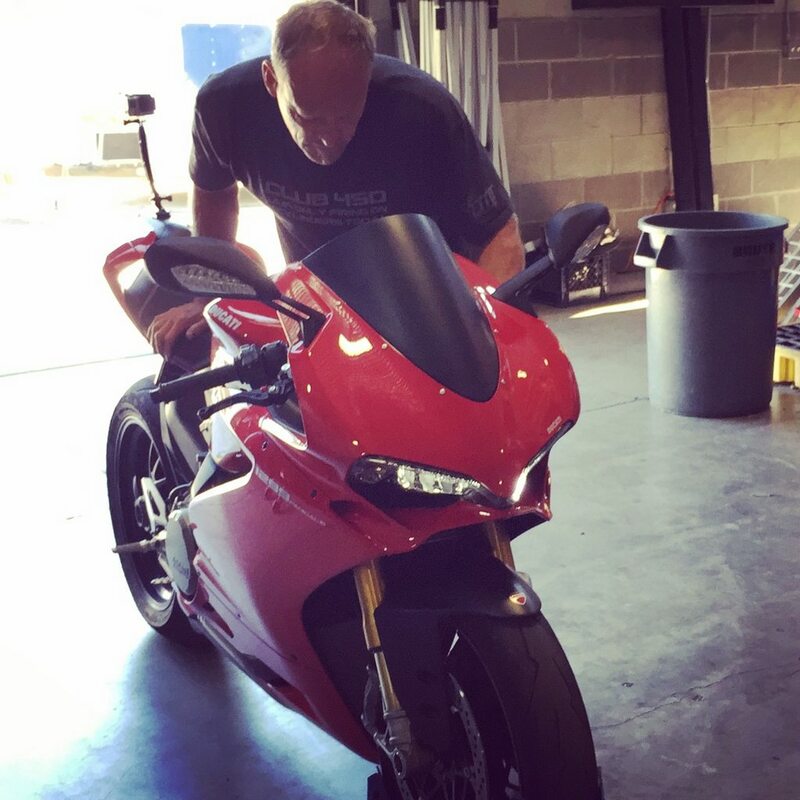 The Panigale does not like too stiffer spring in the rear so what seems normal may not be . You will feel it through the chassis of the bike but only you can judge that . Sag rates are another being they can only be a guide but you need to have starting point and work from there making small adjustments and taking notes nothing too big . I have done a Dave Moss weekend school was great to make adjustments back to back at the track to see what is working and what is not . Thanks guys. I have to admit this is an area I know little about. I need to learn it but procrastination and some luck have made it elusive. Since this particular bike was scratch built and all the stock reference points are no longer relevant I really have no idea where the thing is at right now. I don't even have a realistic ride height measurement as there was no baseline to go off of. I have springs up and down the range if I need to swap. The rear shock is not stock so the spring rate was a guess based on weight. Out of the gate without getting into it, it handles great but that's like a blind guy giving a film review. Additionally I would like to get some numbers on the motor and have the mapping looked at. You would usually go lighter than what is recommended on the rear spring you don't want the spring working on only the top half of the spring it really needs to operate through the whole spring rate . On exit on the throttle you will feel it . These bikes have small window to get right if you push hard but will be good at giving feedback as well . If you don't push that hard the bike will in most cases feel relatively good unless there is something major wrong with it . The more you need to work on your suspension will go hand in hand with how hard you are going to push it .